Title Page of The Natural History of Carolina, Florida, and the Bahama Islands. Digital Image courtesy of The Linda Hall Library, from The Digital Public Library of America. Mark Catesby (1682/83-1749) arrived in Charleston from England in May of 1722 and found “a country inferior to none in fertility and abounding in variety of the blessings of nature, yet its production being very little known, except what barely related to commerce.” His beautifully illustrated two-volume work was first printed in 1731 and 1743. An example of the flora included in Catesby's book. Digital Image courtesy of The Linda Hall Library, from The Digital Public Library of America. 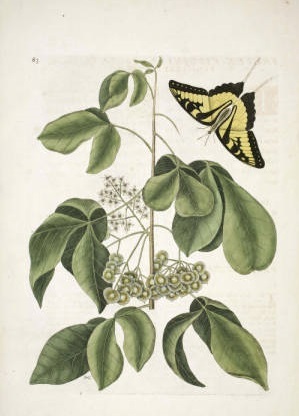 Catesby’s masterwork profiles include 220 plates that depict not only animal and insect life of the early Carolinas, but also indigenous plants and flora. 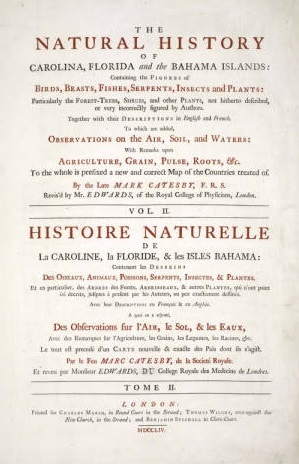 Catesby’s discoveries and portrayals brought obscure ornamental shrubs and trees such as the water oak, the dahoon lily, and the catalpa, to the attention of colonial gardeners.